When my husband requested a pairing with the movie Duets (DVD/Download), I laughed until I realized he was serious. I’m pretty sure everyone in the world has forgotten that this Bruce Paltrow oddball of a movie ever existed, but after screening it again, I’m officially ready to start the campaign to turn this into the newest cult classic. I think it could be the next Wet Hot American Summer or Gentlemen Broncos, if enough people get bored and curious enough to watch it. What other movie out there features Gwyneth Paltrow, HUEY LEWIS, Paul Giamatti, Andre Braugher, Maria Bello, Maya Rudolph, Scott Speedman, Angie Dickinson, John Pinette, AND Michael Buble??? The only place in which all of these seemingly random entertainers could co-exist is in the karaoke arena. Having just tried karaoke for the first time myself a few weeks ago, I see how it can happen. You have a couple drinks (or, okay, maybe half a bottle of pink champagne), you enter a small dark room filled with total strangers, random people get up and start singing “Rapture” and “Rocket Man”, and eventually, you’re up there, belting out the high notes on Minnie Riperton’s “Lovin’ You”. It’s fun and addictive, and if you never see these karaoke strangers again for the rest of your life, who cares? That’s kind of what happens in Duets. All of these random souls converge at a karaoke contest, and suddenly you have John Pinette belting out “Copacabana” in front of Gwyneth Paltrow, while Paul Giamatti sits nearby wearing a George Michael earring, and Huey Lewis waits his turn to go up and sing THE WORST songs in the movie. Seriously, how did they give the one professional singer of the bunch stinkers like “Lonely Teardrops”? Paltrow and Giamatti hold their own, and as much as Ms. Goop annoys me, her duet of “Cruisin’” with Huey Lewis is pretty solid (it even went to #1 on the Australian music charts!). But wow- Paul Giamatti. Who knew he had such a voice? This movie is worth watching, if only to see him channel Otis Redding. For a movie like Duets, I had to pick a two ingredient cocktail. Think of it as a duet in a glass- two simple ingredients, making beautiful music together. I also wanted to choose a beverage that I might actually drink in a karaoke bar. Something strong enough to get me on stage, but easy enough that even a bartender at the seediest bar in Omaha could manage it. While watching Duets, I recommend drinking a Whiskey Ginger. 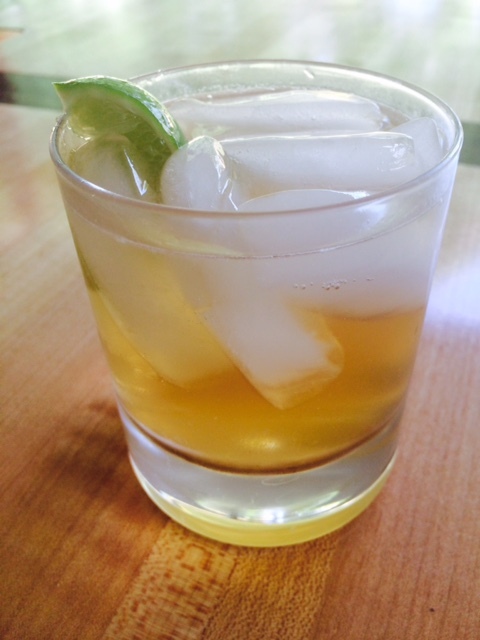 Pour the whiskey and ginger ale into a glass over ice. Give it a generous squeeze of lime, then top with the lime wedge. Although the plot and pacing of Duets leaves a lot to be desired, I was thoroughly entertained for 2 hours while waiting to see which rando celebrities would make an appearance. Does it make me want to get back into a karaoke room? Not really. Does it give me newfound appreciation for 80’s pop star Huey Lewis? Absolutely. Cheers! Posted in Comedies and tagged Andrew Braugher, cocktails and movies, Cruisin', cult classic, Duets, Gwyneth Paltrow, Huey Lewis, John PInette, karaoke, karaoke cocktail, Maria Bello, Maya Rudolph, Paul Giamatti, Scott Speedman. Bookmark the permalink.